Love the layout of the app and the practice test feature was extremely useful! This app is a great supplement for taking the ADX test. They offer a lot of simple tricks and clear understanding through text and videos. You won’t go wrong adding this app for your studies! This app was very helpful in preparation for the ADX test. The app is well arranged, easy to use, and extremely fast. The study mode and quiz modes I thought were the best to gain knowledge of the material. The Exam simulator can be adjusted to you liking, but is still very similar to the actual test. This is by far the best ADX test prep I found. Totally worth the cost!! Makes understanding and memorizing much easier. Passed my ADX test first time because of this app. It is a must have!! This App is the absolute best! I would not have passed the ADX with out it, Definitely a wise investment and Money well spent! This app has helped me a lot when preparing for the ADX test. It made a big difference when I was away from home because I could just pull out my phone and continue studying! Was very helpful. Had limited knowledge about the aeronautical aspect of becoming a dispatcher, but between the study mode, test mode and practice exam, was able to pass the exam on first attempt. Well worth it. Sheffield ADX Prep is the BEST, most efficient and thorough way to study for the ADX Dispatch Exam. I used Sheffield ADX Prep and ATP Prepare to prepare for my ADX Dispatch Exam and the ATP Prepare didn’t explain ANY of the mathematical equations, which led me to the Sheffield ADX Prep App. The Sheffield ADX Prep App includes outstanding videos which breakdown and dissect each equation making each easy to understand. Definitely recommend! New Sheffield School of Aeronautics’ “FAA ADX Exam Pre” has clear screen layouts and is much easier to use. My study efficiency was going up. Technical service staff was always quick to respond to my questions. So I didn’t waste my study time. I’ve learned how to budget my test time using the “Exam simulator mode.” They really know about the real world of ADX. (This is obvious if you check the school history) I strongly recommend the “Sheffield School of Aeronautics – FAA ADX Exam Pre.” It helps you succeed in the knowledge Test. I passed the ADX Knowledge Test on the first try. Thanks Eric for the great study app! I had been studying using the older version of the app for months which was great but had its quirks. Now with the newly streamlined app, I finished my Exam Prep much more efficiently and passed my ADX comfortably! Now on my second round of reviewing the various modules and re-attempting the quizzes to self-gauge my progress. The study tips and explanations greatly helped me retain much of the info. Well worth the investment. Great study tool to use to study/prepare for the FAA aircraft dispatcher (ADX) test. Lots of good material, and also lots of good explanations of each question/answer and the reasoning behind why which answer is better than the other. I got this app a few weeks ago to help study for my upcoming ADX. I did have a technical issue with one of the modes but as soon as I emailed Mr. Morris to notify him of the problem, it was fixed within a few hours. The app is very easy to navigate and is divided into convenient sections for easy study on the go. I definitely recommend it for its content and timely technical support! Best app to prepare for the ADX test. The quiz, study and test modes gets you ready for the test like no other app. I’ve been using this in conjunction with one of the study books and it is a really, really, really great app! It’s easier for me to do the bulk of reading and learning from written material, but testing myself to gauge my level of knowledge and understanding would be so tedious and inefficient if I tried to only use the book. I do not do any studying without using this app alongside. It’s complete enough that you don‘t also need a book, it’s just easier for me that way. The app has all the questions from the test bank, and you can choose to study a section at a time, or even just a sub-section. The different modes are awesome. You can quick-test your knowledge with instant right/wrong feedback on each question, you can choose to get explanations after each question, or just do a test and find out the score at the end. I think the Practice Exam function is one of the best features. It even stores a certain amount of your results so you can see if there is something you’re consistently struggling with. Like someone else said, if I find myself waiting in line somewhere I can study a section or two quickly on my phone but I mainly use it on my iPad at home or work. The format is pretty simple and straightforward, intuitive, and makes studying/quizzing quite efficient. In my opinion it was absolutely worth the price considering how much I use it, what I can get out of it and how much time I’ll have spent studying when all is said and done. I’m almost ready to take the real exam and I feel totally prepared and confident about what to expect. I love this app! I think the study mode is outstanding. The explanations are very easy to understand and I love the the information stating which questions are outdated. Also, the tips on how to get a correct answer are very helpful. I use the study guide once for the explanations and the quiz mode to really put the answer in my mind.The price is very inexpensive when I factor in the help this is giving me to prepare for my class soon. I couldn’t imagine not using this. …The app is updated and edited frequently from what I could tell – including the questions, images, aircraft categories, audio clips, even some video clips, etc.. ..There are B-737 operating/performance questions, which the app explains really well. Regarding other info, I see the new, smaller aircraft questions in my app, and have spoken to colleagues who all passed their ADX test after using the app. All I know is that this app sped up the study time needed to easily pass the ADX for me. Sheffield will also send you any detailed supplement files that might be a space hog on an app, if you request it. They even gave me free access to their web site resources for studying. I just asked for it. That alone would cost more than the app itself, so this app is MORE than worth it. I used this app to prepare for the ADX test and passed with above an 80. The app is easy to use and very helpful. Great app from a great organization!! Put on your phone and study anywhere conveniently and discreetly. I studied before meetings, waiting on movies to start, at games during timeouts, etc. Well worth the cost for the content and convenience. While some of the other reviews here mentioned the cost of this app as a consideration, I’ll start by saying disregard that if you’re weighing several options to prepare for the ADX exam. Having taken more FAA written exams over a career in aviation than I care to recount…this app is by far the most user friendly, comprehensive and even entertaining program to prepare you for not only the exam, but also for the course work that would naturally follow its successful completion. I’m several weeks into using the app, admittedly far more sporadically than I should be, so my review here is based on how well I feel I’m making progress toward the ultimate goal. And so far…I feel 100% positive. I’ll leave a second review once I pass the exam itself (because having a few weeks with the app I feel certain I’ll not only pass but ace the exam!) As for the what’s actually functionally good about it…I’ll cede to the other reviews here as they nailed it precisely. Structure, organization and ease of operation are all there. I guess the point of leaving a review is to offer a little guidance on whether or not your money is well spent on whatever app one is considering, I’ve relied on reviews often myself for that reason. So let me make it an easy decision, this is the first review I’ve ever written because I feel so strongly that your money will be well invested in the Sheffield ADX Test Prep app. I recommend this app for ADX study. I used it as my primary source for practice questions and found it very helpful- especially study mode and the explanations for almost every answer. It gives you immediate feedback and you can memorize a lot through word association. If I had to do it again I’d buy this app sooner (the price scared me off initially) because I got a ton of use out of it. It’s really easy to practice an entire section whenever you have a few spare minutes- that’s what sets it apart from other study methods. In short, get this app, don’t worry about buying books or anything else. Put the time in and you’ll pass the ADX easily. This app is well worth the money. I have been using it for quite a few weeks now. Easy to use and get around. Each exam subject area is broken down for easy learning (or memorizing). I will be taking the ADX soon and hope this app and my studying paid off! “I have never seen such a sophisticated and easy to use learning and training method like the app from Sheffield School of Aeronautics in Fort Lauderdale FL. 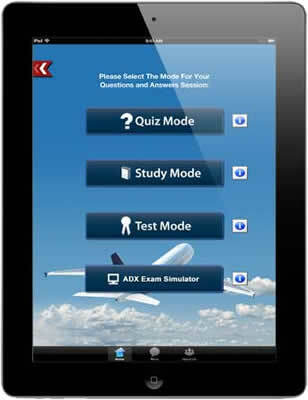 It contains all questions related to the ADX Knowledge test by the FAA. The questions are corrected where necessary and there is an explanation for each answer. 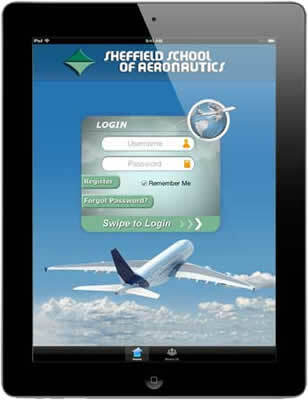 You will also have access to the protected scripts from Sheffield School of Aeronautics. I doubt anybody has written a 45-page pdf file with zoomed images to explain one flight log completely. In addition the support from the school is just great! I can absolutely recommend this high standard product! An app for real professionals or those who want to become one – great job!